I didn't get much sewing done over the weekend, but I did spend some time on quilting related activities. I've been invited to do a trunk show the end of the month for a guild in my hometown. Out of the 100 quilts I've made I needed to select 12 quilts for my talk. I immediately tossed out the quilts that are not quilted and the ones that don't live at my house, taking my total down to around 50. Right now I think I've narrowed my list down to 15. Besides picking out the quilts I also spent some time getting out the original patterns, laying out the quilts, and printing off the blog posts where I talked about the quilts while I was working on them. It was a fun stroll down memory lane but it pretty much ate up all my free time on Sunday. Who knew getting ready for a trunk show was so much work. Although, it is my first, I guess if I'm asked again by another guild I'm good to go! I also did a little research on the Carolina Lilly block. 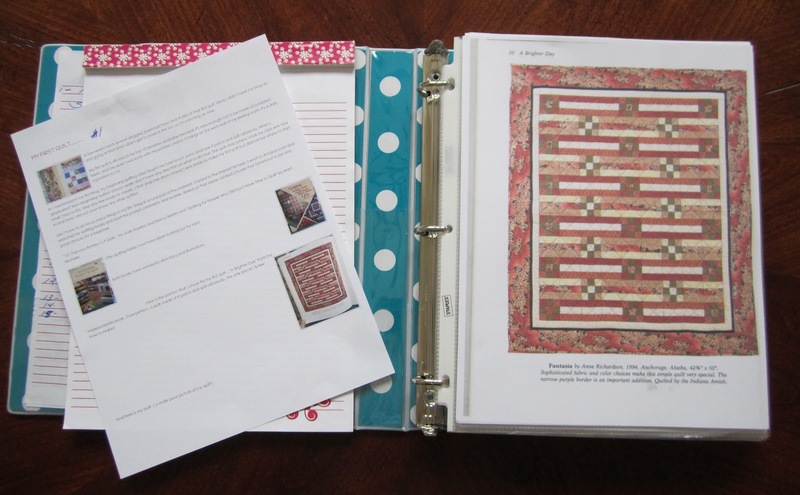 A book that I often use when researching blocks is The Quilter's Album of Patchwork Patterns by Jenny Beyer. It has over 4,000 pieced blocks listed and is a great reference. 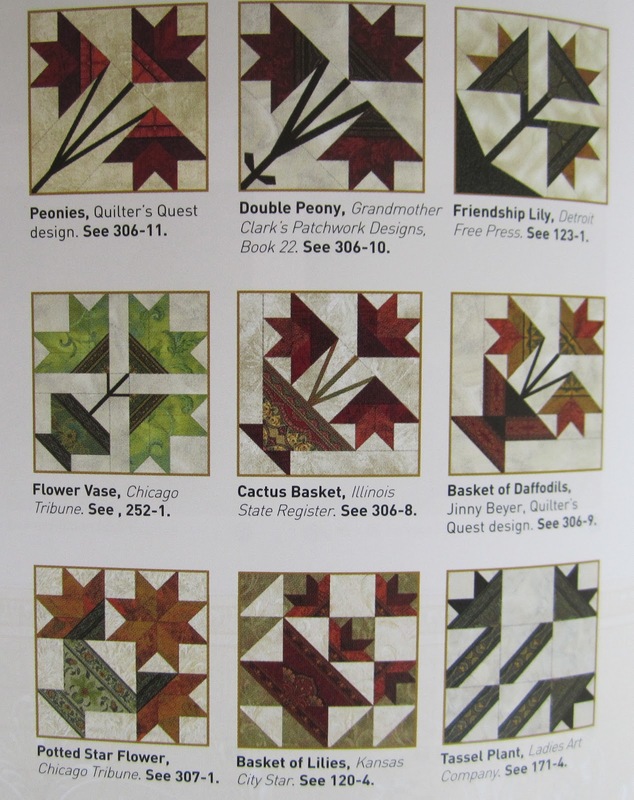 Here are a few lilly blocks pictured in the book. Most of the baskets don't have handles. So I'm dumping the handles on my Carolina pattern but will appliqué the stems, I can appliqué. The majority of the comments left on my last post suggested that I omit the handles, so we're all good! I really like this block, the full flower in the center with the half flowers on the sides, maybe I'll make another quilt using this block and more modern fabric. 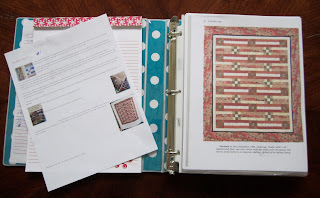 I can't decide if I'm a modern quilter or a traditional quilter, maybe I'm a little of both. 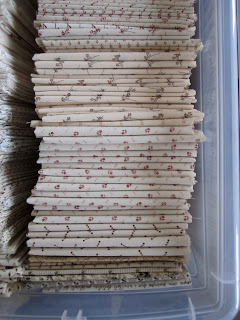 Someone asked me to demo how I'm folding my fat quarters that are stored so neatly in those plastic bins. I wish I folded like Moda, but I don't, I wish I had a nickel for every Moda Fat Quarter I've refolded. fold fat quarter in half, selvage to selvage. Take each end and fold to the center. bring those two ends together, folding that piece in half. I fold the fabric in this fashion in order to get this fold on the longest end, so more fabric is showing at the top, making it easier to select and pull fabric from the bin. 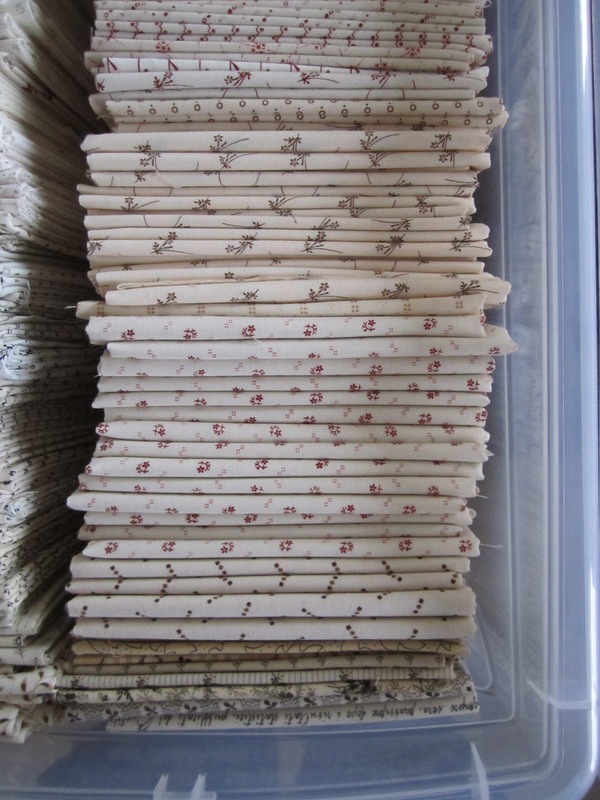 Here's a stack of all the fat quarters, folded edges up. Next hot topic - I've gotten a couple of requests from folks wanting to be notified by email when I create a new post on my blog, the application is now available below my followers list on the lower left side of my blog. And last but definitely not least, Judi Madsen, The Green Fairy, just finished quilting my Evening Bloom top. She did an amazing job and blogged about it here. She has several pictures on her blog, be sure to check them out. It's not home yet, but I've never seen a quilt look better in pictures than it does in person, I can hardly wait to see it. I'll be holding my breath and crossing my fingers until it hits my front porch! Have to say, you give the best info and love reading them....thanks. 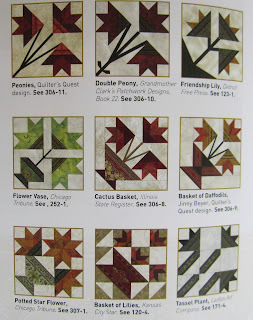 Now, I did see your quilt on Green Fairy's blog and drop dead gorgeous quilt.....I kept going over and over. Love this quilt and what a beautiful quilting job she did! Will be talked about for some time and you should enter into a show contest. Morning, Thelma. Your evening bloom quilt is stunning and Judi did an amazing job. Have a great day! Your Evening Bloom quilt is absolutely stunning! Would love to see your Trunk Show. Am slowly catching up on your blog posts after finding your blog a month or so ago. LOVE your blog! Good morning! Terrific post, as always. I love that Jinny Beyer book, but then I love block books of any kind. But it will be SO worth the wait. Luckily you have been so diligent in writing your posts and numbering your quilts. You already have order in place, so a trunk s show will, I'm sure, be easy for you to compose. I mean... how hard is it to talk about what we love??? You will be wonderful Thelma! But beware... I did that for my guild a year ago... and now they nominated me to be the featured quilter at our Annual Quilt Show. Your Evening Blooms is incredible! I just had to wipe the drool off my mouth... I was in a daze looking at it! Now I have to hop over to GF to see more pics! You make me want to finish my UFO (Evening bloom!) I have the border to create and attach then I can do my quilting! That looks GORGEOUS!!!! Wow, Judi is some quilter. She took your already awesome quilt and turned into a masterpiece with all that intricate quilting. I'd be anxious for it to arrive home too. 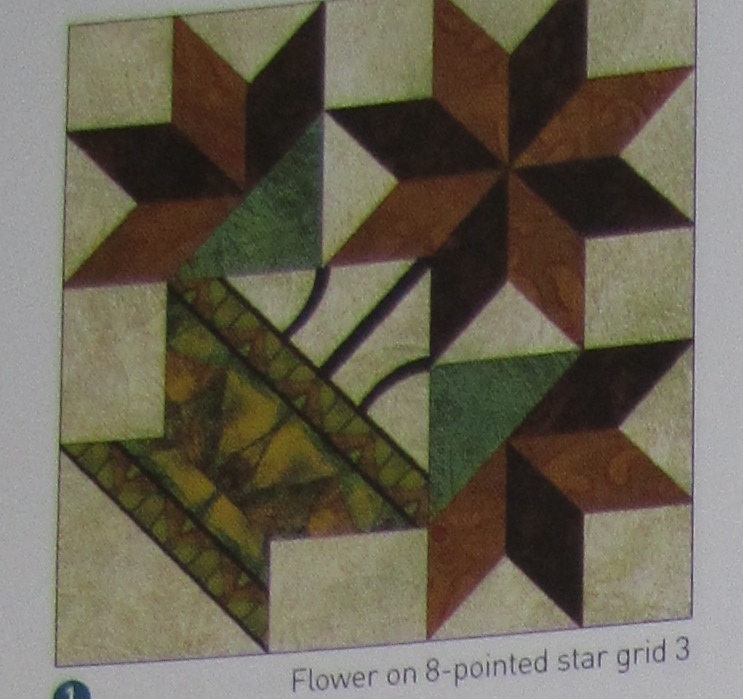 I have a lily quilt on my to-do list as well but am thinking of going with the Fig Tree pattern. Stems are appliqued but no pot or vase at all. I like some of the options from your book too. It would be great to see your quilts in person. Wish I could see that trunk show! Good luck with prep for the trunk show. A lot of work to be sure, but chances are you'll get to use it again, and again, and again. And what a treat for your audience. Your Evening Bloom is stupendous! Your beautiful work, plus amazing quilting. A real treasure. Congratulations! Thelma, I'm gasping at the incredible site of your Evening Bloom!!! I have no words to do it justice!! Love your Evening Bloom!! That one is on my list. :-) I would sure like to be in the audience at your trunk show~ those viewers are in for a real treat! Enjoy! The Evening Bloom quilting is unbelievable! Absolutely stunning. I hope you are able to take that quilt along to your trunk show. Good luck. What a stellar blog post! So much to comment on but suffice it to say, the link to Green Fairy's quilting of your applique quilt will probably be the most "linked" post EVER! Such an outstanding job of quilting of a likewise amazing quilt! I passed it along to all my quilting friends for them to ohh and ahh over. Please tell us you'll enter this quilt is one or more important quilt shows! You reminded me of a Carolina Lily table topper I need to finish. It is paper pieced and just needs quilted and bound. I saw your quilt over on Judy's blog. OMG! Get ready for a blue ribbon on that one!!!!!!! Your Evening Bloom quilt is absolutely exquisite! I'm not understanding how the "fans" are cut -- can you share how you did yours please and thank you. Did you use the template in the book -- did you press the fan seams open? When I tried to use the book template adding the 1/4" I couldn't sew across the top of the template to get it correct -- and it looks like you did -- the bottoms of my fans aren't square away like yours are -- any help would be appreciated so very much. Judi did a magnificent job on your quilt. I read her post last night. It is gorgeous! And you can now come to my house and fold all my FQs like that. Mine are so willy-nilly. LOL. The quilt is gorgeous! Judi did a great job with the quilting! I have to go look at other pics of it on Judi's blog. It's looking amazing and fantastic thanks for all the effort which you did for us. evening bloom is so stunning, i sort of wanted to cry when i saw it finished on judi's blog. what a treasure! 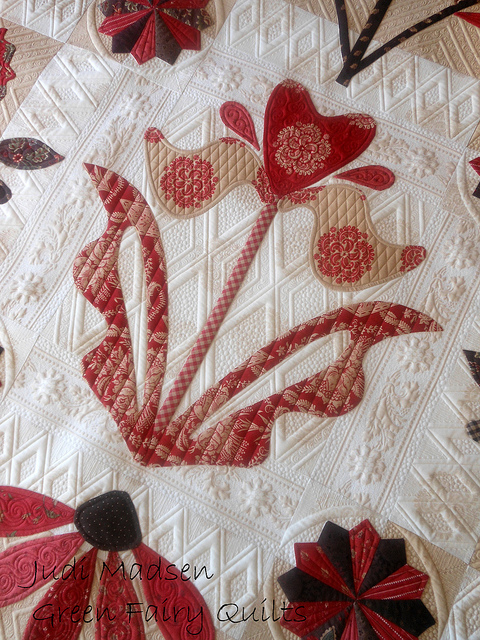 I just had a look at your quilt on Judi's blog: it's amazing!! What a beautiful job both of you did on it!! Finally, a flower is blooming at my house . . . .
A Friday Finish . . .
A few updates . . . I was gone, but now I'm back . . .
Blogger Girl BOM . . . .